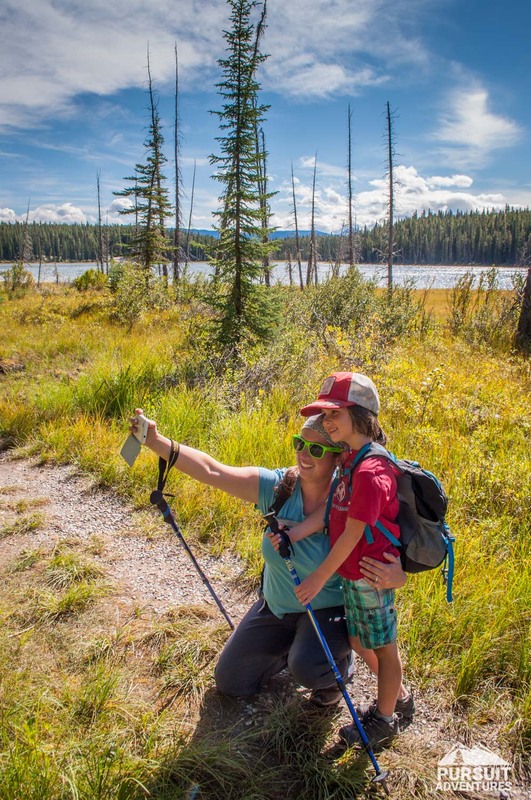 An easy, family friendly hike along the shores of Goldeye Lake for those looking to stretch their legs on the drive through David Thompson Country. 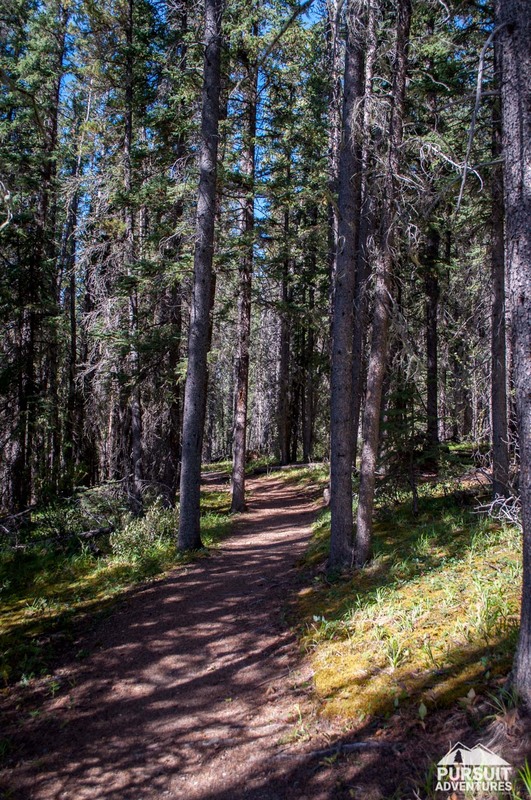 We would definitely recommend this trail if you’re staying at the campground or just looking to stretch your legs on the way through. After a crazy summer we finally had a chance to head out for a couple days of family fun. We’d originally planned to do the second mine tour but they had closed for the season the day before. Making new plans on a lazy day we decided to head out for a short family hike. 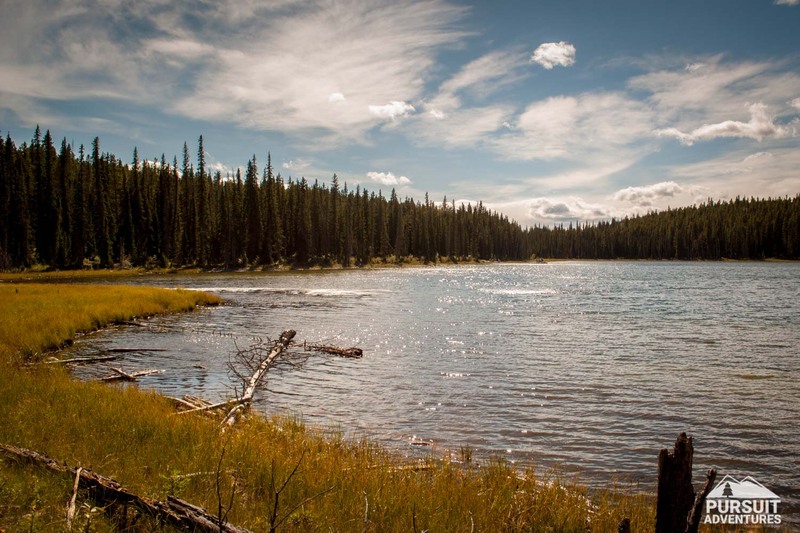 We hadn’t spent much time at Goldeye Lake before and since we’d often heard about it we decided to give it a try. Maybe our expectations were too high but we were a little disappointed with this hike. 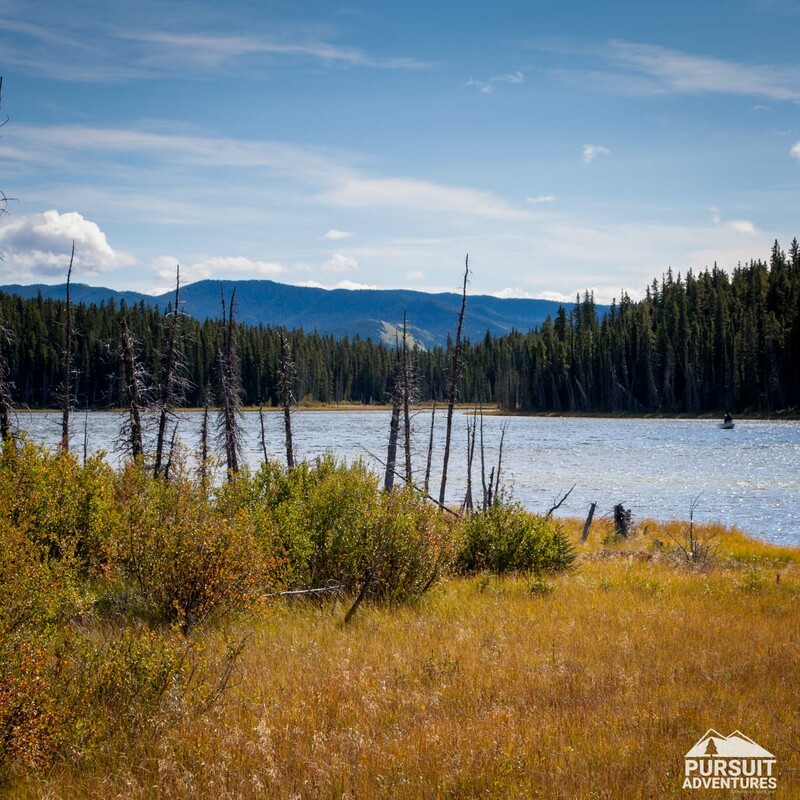 While pleasant and a great option for an evening stroll, we found that this walk didn’t offer views or an experience as good as nearby Fish Lake. Trail conditions can change quickly. The map and directions below are based on our hike in the area on August 31, 2015. 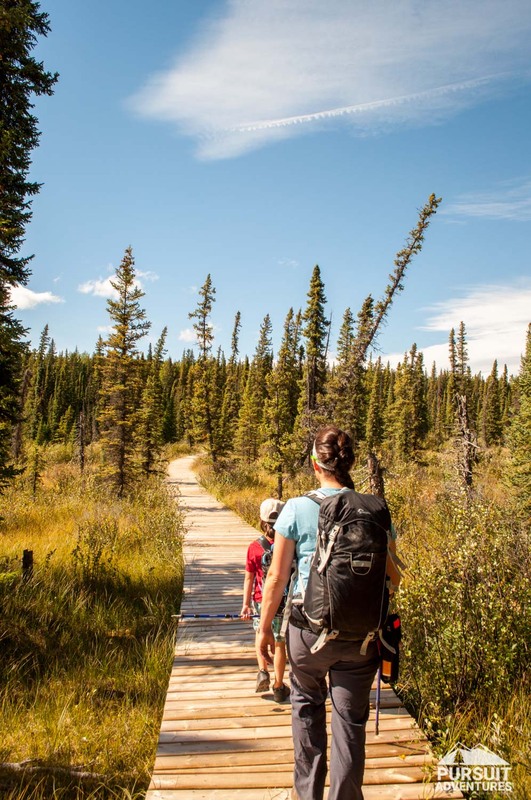 Alternate Descriptions: The David Thompson Highway – A Hiking Guide includes a side trail to a set of falls on Black Canyon Creek along the way. 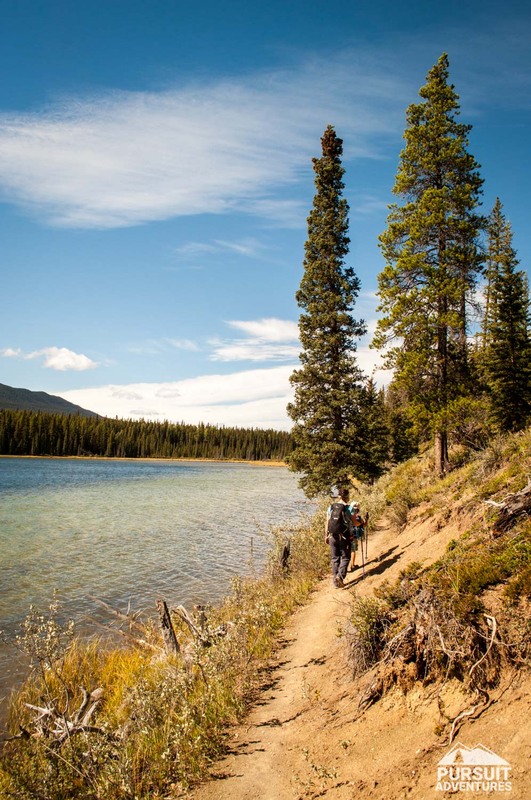 The trail is also described in Nordegg Area Mountain Bike Trails by Frontier Lodge. 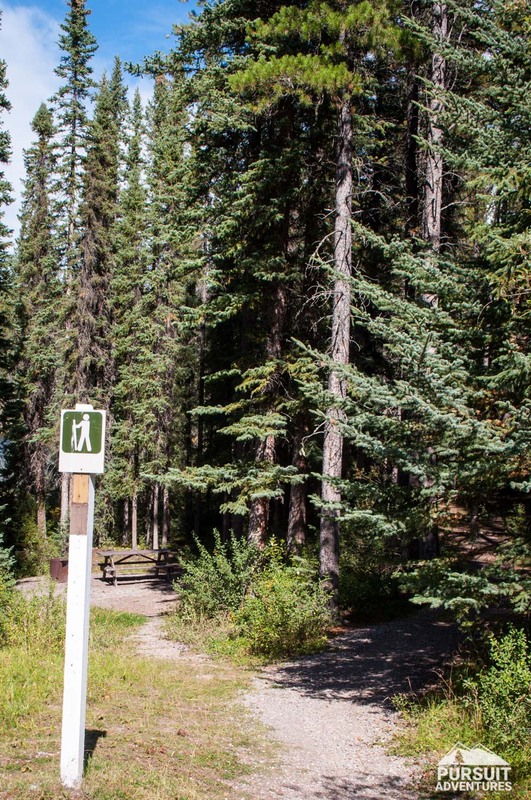 Trailhead: The Goldeye Lake Provincial Recreation Area is approximately 11 km west of Nordegg and 83 east of Saskatchewan River Crossing on Highway 11. The trail starts in the day use area of the campground. 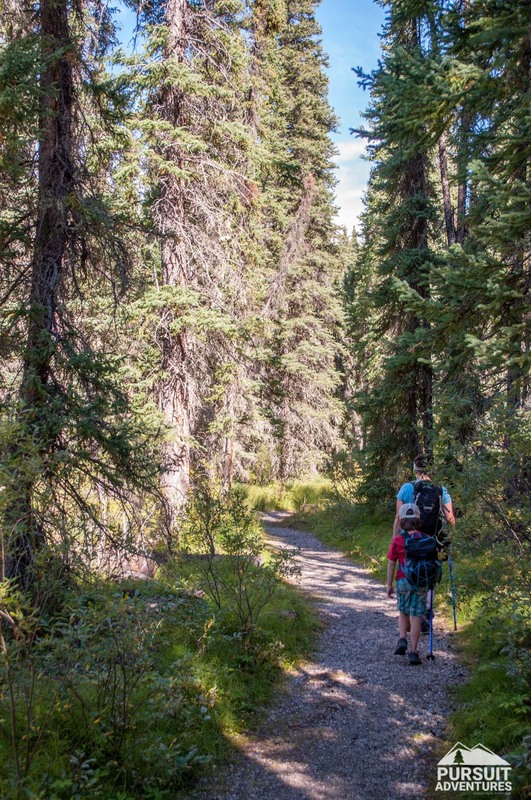 Make the most of your adventure and head out with a guide.  Pursuit Adventures offers guided hikes from April to November. 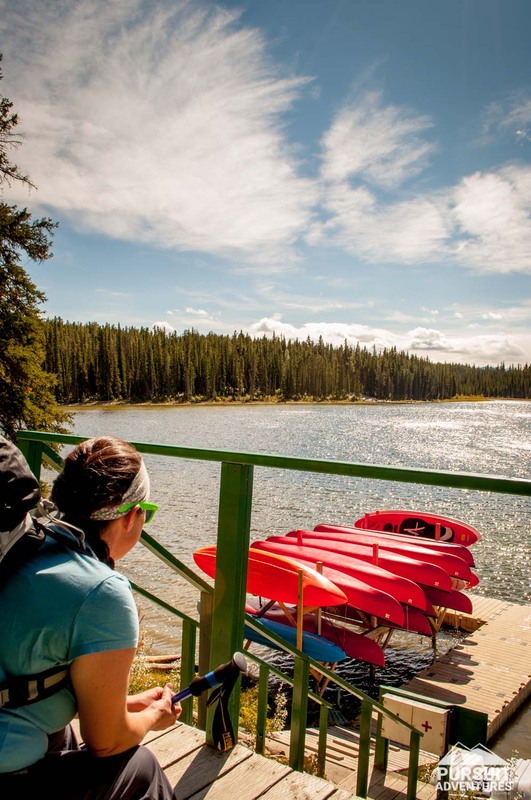 Get in touch with them to plan your custom adventure to Goldeye Lake. Sometimes you just want to head out on your own to explore the area. We get it. 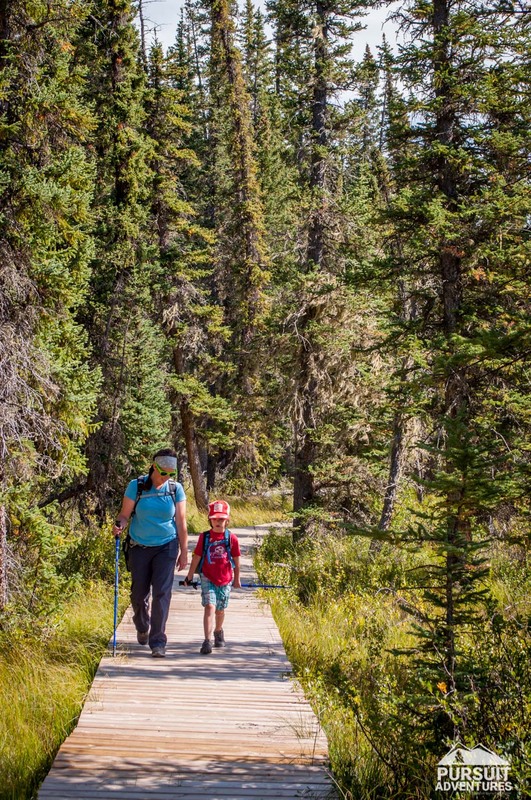 Here’s the guide for the Goldeye Lake trail. The trail starts at the north east corner of the day use parking lot. 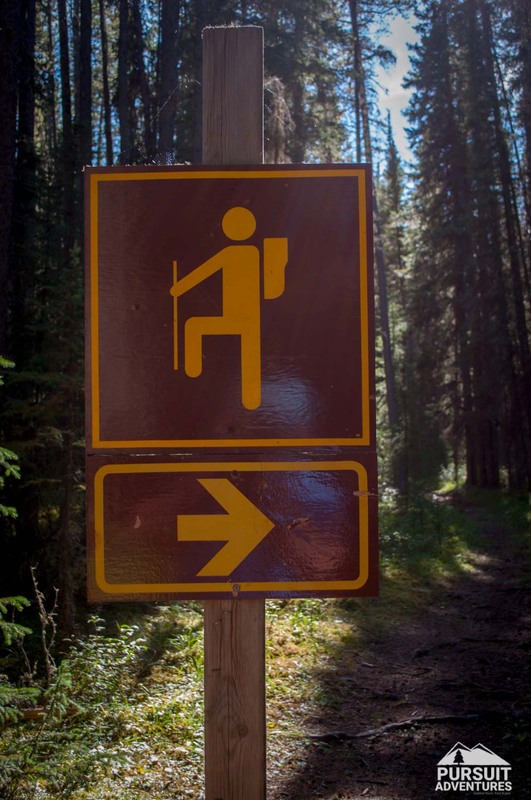 Follow the hiking trail sign past the day use picnic area and into the forest. After 300 metres the trail emerges along the lake shore. From there you will pass the fireguards that were built around the Goldeye Centre along with the stairs to the centre and their dock. They now offer canoe rentals which seemed very enticing on a warm afternoon. 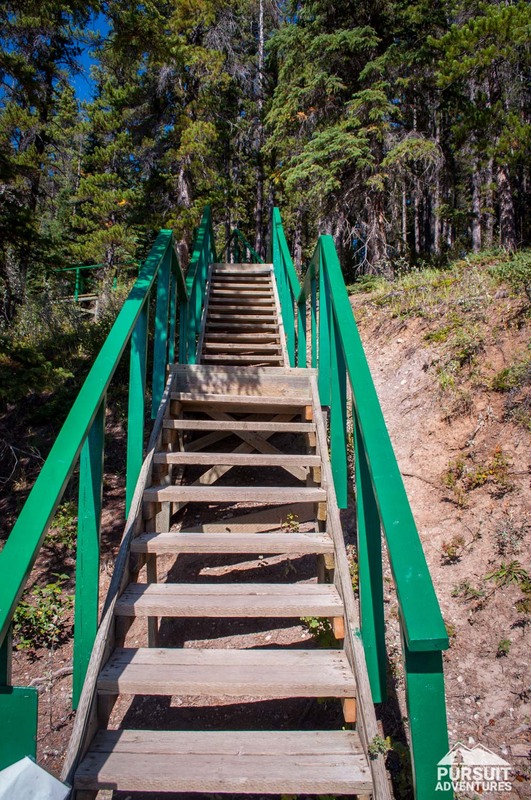 The Goldeye Centre is a private facility, please respect their property and stay on the trail through this section. Shortly after the second fireguard, the trail heads into the forest. The trail merging from the right at 0.7 km leads back to the Goldeye Centre, continue straight ahead. A 100 metres later the trail emerges from the forest into the marshland. 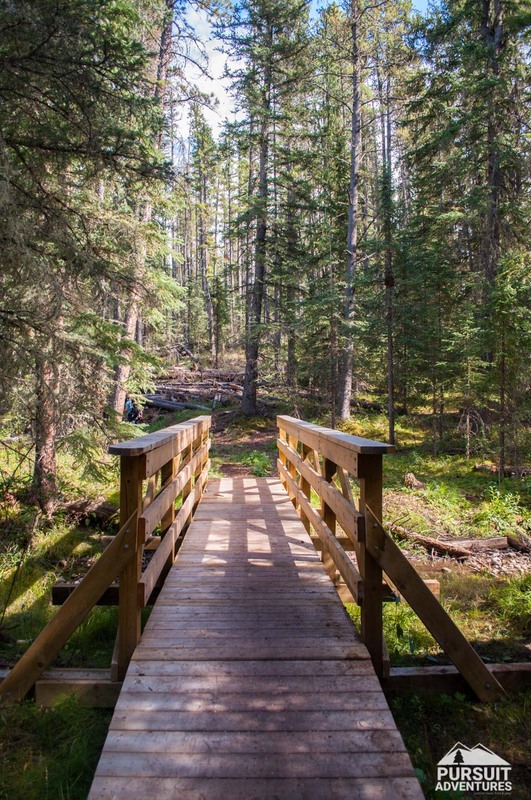 As you follow the boardwalk take a few minutes to enjoy the view and appreciate this sensitive and ecologically significant area.This is probably the best part of the hike. From there the trail heads back into the forest, offering glimpses of the lake along the way. At 1.9 km there is a junction. The main trail is straight ahead. I believe that the trail to the right is the Goldeye – Dryhaven connector described in David Thompson Highway – A Hiking Guide. The trail to the left leads to the lake shore. Shortly after this junction there is a bridge over the Black Canyon Creek. 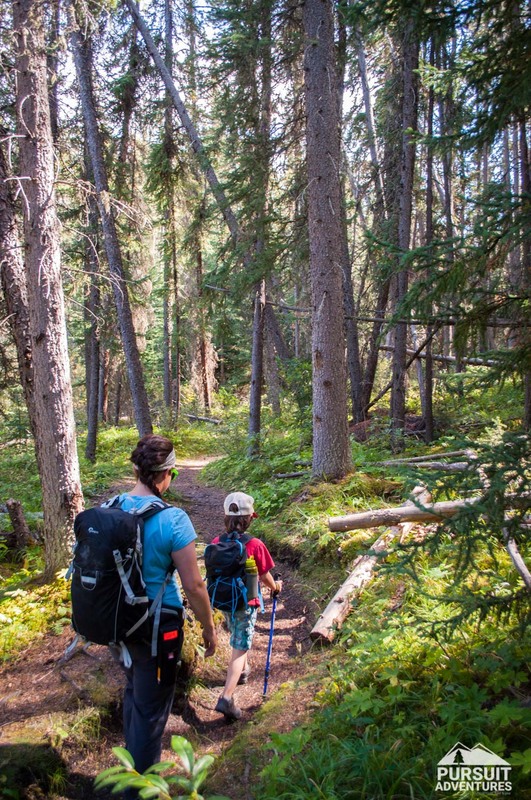 Stay on the main trail to return to the trailhead. The path to the right immediately after the bridge appears to lead to a set of waterfall. We’ll check it out on a future trip and update. If you’ve taken this path please let us know in the comments below. The trail returns to the day use area next to the dock. 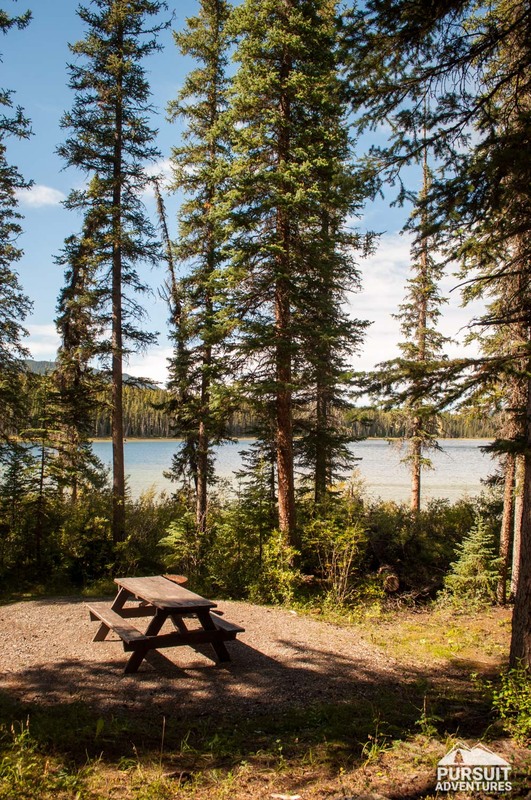 The perfect spot to enjoy a break after your hike. This area has cell phone reception. 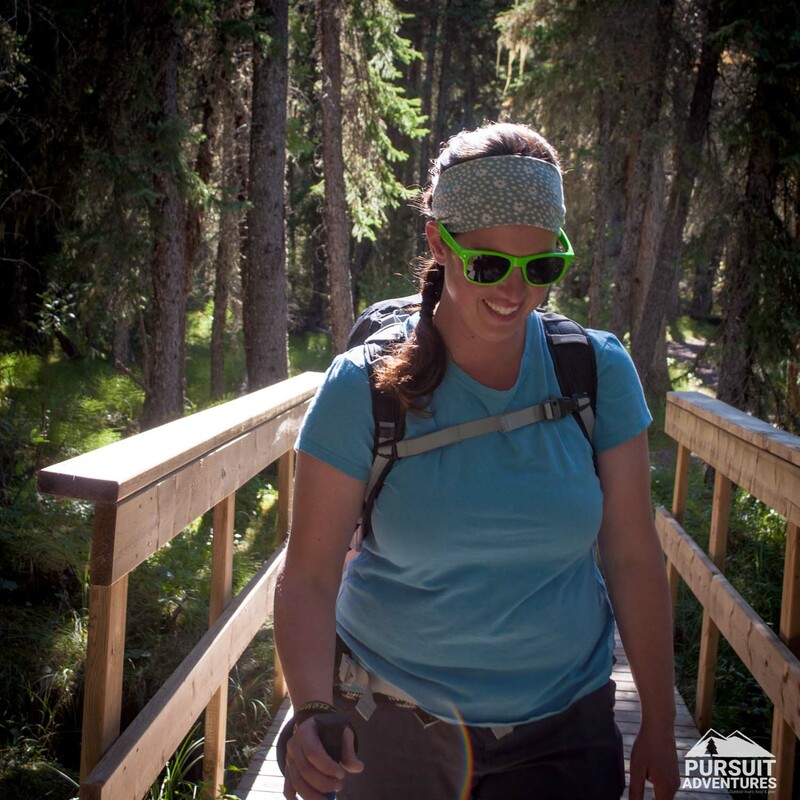 We recommend carrying an InReach on your hikes. 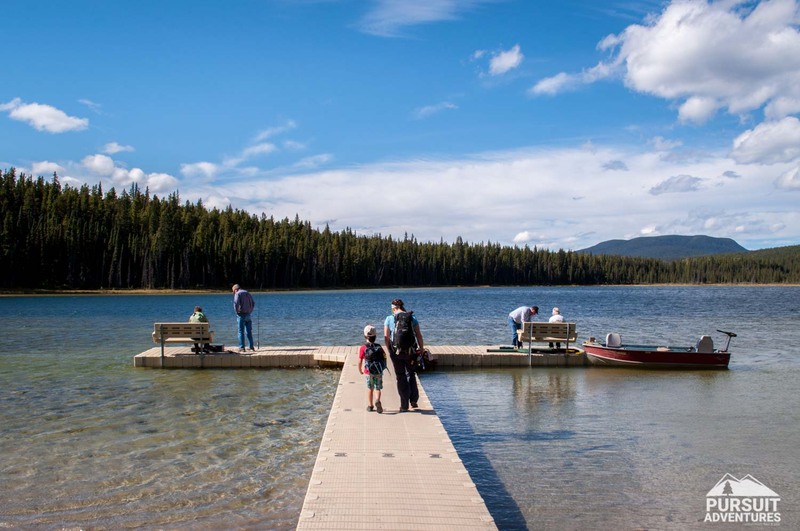 A pay phone is available at the Goldeye Lake Campground.